The breathtaking battle for Rome will start already this Friday, on the 22nd of November, on Xbox One. 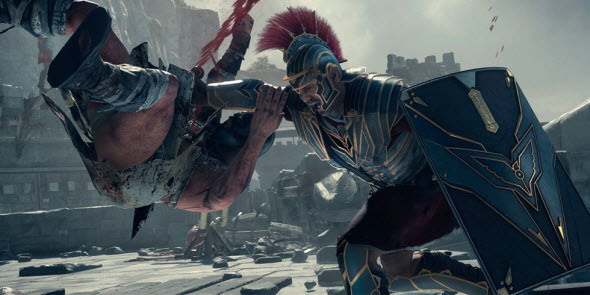 And in order that you can imagine how it will look like, Microsoft - the publisher of Ryse: Son of Rome - presented epic game's launch trailer just about an hour ago. Ryse: Son of Rome is an exclusive action-adventure for Xbox One and one of its great launch titles. The game is set in the ancient Rome, at the background of which Marius Titus - the project's protagonist - takes vengeance on the murders of his family. Ryse: Son of Rome will be released on the 22nd of November together with Xbox One, but already today we can watch its launch trailer. Ryse: Son of Rome trailer shows us not only the ancient Rome, but also "so many enemies" that it has. There are a lot of battles in the video, but we are sure that in the game there will be much more. Although it is not a good time for the great empire, the game's characters are not going to give up: "Rome will not fall. Not today. Today we will fight." And are you going to fight for Rome this Friday?